According to Symplur.com, a site that provides analytics for health-related Twitter activity, there are “1 million tweets relating to healthcare each day.” The presenters said that, when used well, Twitter “gives the opportunity to collaborate, connect, and share meaningful professional relationships.” Twitter was also presented as a way to reach the public with health messages. Alisa Hughley pointed out that even people in lower socio-economic groups are likely to have smartphones (possibly the only computer they do own). The presenters talked about how to use Twitter to help a healthcare organization: Twitter can help drive traffic to your website, and it is an incredible resource for connecting with experts and stakeholder communities. By connecting with others who already have large followings, you can increase your own following. The participants then broke up into groups and practiced crafting tweets centered around specific health care messages. We discussed some of the tweets participants created, talking about the value of language that is specific, engaging, and uses as few words and characters as possible. We also talked about Twitter “etiquette”: crediting the author when retweeting, etc. We learned that good tweets are those that add value to the community in which you are participating, including citing resources. HIPAA privacy and other standards of confidentiality should always be respected. 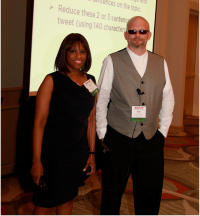 The presenters demonstrated a few online tools for tweetchatting, how their own Tweet Chat works, and how to use analytics to gauge one’s effectiveness on Twitter (how many users reached and how engaged they are, for example). They offered several online resources, such as http://www.healthit.gov and http://www.pewinternet.org.